FrontlineSMS:Medic today launched www.HopePhones.org and Hope Phones, a nationwide mobile phone collection campaign supporting mHealth programs at medical clinics in over 30 countries. The campaign will make use of old cell phones in the US to provide phones for clinics and healthcare workers in the developing world. Cell phones are valuable tools in the battle to reduce disease and illness. The field of mHealth – the provision and coordination of health-related services via mobile communications – is blossoming in response to a global shortage of healthcare workers and the demonstrated impact made by simple, mobile tools. Hope Phones will make use of the nearly 450,000 cell phones discarded every day in the US. HopePhones.org allows donors to print a free shipping label and send their old phone in to The Wireless Source, a global leader in wireless device recycling. The phone’s value allows FrontlineSMS:Medic to purchase usable, recycled cell phones for healthcare workers. Hope Phones lets you give your old cell phone new life on the frontline of global health. Just one, old blackberry will allow FrontlineSMS:Medic to purchase 3-5 cell phones for healthcare workers, bringing another 250 families onto the health grid via SMS. FrontlineSMS:Medic is an nonprofit organization advancing rural healthcare networks in the developing world through the implementation of sustainable, appropriate technologies delivered through mobile phones. Its first pilot project distributed cell phones to community health workers in 100 rural villages in Malawi, saving thousands of dollars in travel and hospital costs and doubling the number of patients treated for tuberculosis in the catchment area. Stories about FrontlineSMS: Medic projects have been featured in CNN, Discovery Channel news, the BBC, The Guardian, PC World and Reuters. The organization uses FrontlineSMS, a free, open-source software program that enables large-scale, two-way text messaging using only a laptop, a GSM modem, and cell phones. Their pilot implementation model places a laptop running FrontlineSMS in a central clinic and distributes cell phones to healthcare workers to coordinate care with patients in peripheral villages. 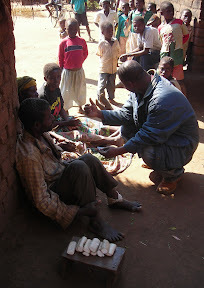 Their programs currently serve 1.2 million patients in Malawi and Uganda. Future development of the FrontlineSMS:Medic platform will encompass electronic medical records and diagnostics at the point of care. Coupled with free, open-source software, the hardware provided through Hope Phones will scale mHealth initiatives, connecting thousands of clinics worldwide to remote healthcare workers and patients. The campaign was designed in partnership with Wieden+Kennedy – the global advertising agency of the year in 2007 and the creator of Nike’s “Just Do It” campaign – with support from kiwanja.net and The William and Flora Hewlett Foundation. 1. Visit www.HopePhones.org and donate your old phones. Email your friends, family, classmates and coworkers. Post on Facebook and become a fan of the Hope Phones page. Tell the world on Twitter – use #HopePhones as a tag so we can thank you. Let us know if you want the Hope Phones widget for your website or blog. 3. Contact us at info@hopephones.org if you’d like to help set up a Hope Phones collection center. A huge congratulations on this Josh – to you and everyone who’s worked so amazingly hard on it. I am totally in awe of the ‘get up and go’ attitude of everything that’s happened around FrontlineSMS:Medic. A real model for others, if ever there was one. HopePhones will help save lives, delivering very real impacts to mHealth. I like this idea very much. I hope it will work. Damn, awesome website. I actually came across this on Google, and I am happy I did. I will definately be returning here more often. Wish I could add to the posts here and bring a bit more to the site, but am just absorbing as much info as I can at the moment. greetings there, i just saw your website on google, and i would like to say that you compose interestingly well via your web portal. i am very impressed by the mode that you express yourself, and the subject is good. in any case, i would also like to acknowledge whether you would love to exchange links with my blog? i will be to the great extent than willing to reciprocate and enter your link on in the blogroll. anticipating for your reply, thanks and enjoy your day! i guess mobile phones in the future will feature more processing power and great graphics’”"
This blog can certainly feel lives. Appreciate all you’ve got created on this. I will certainly continue returning to view much more of work. care of to stay it smart. I cant wait to read much more from you. daily, if so after that you will absolutely get good know-how. Howdy! Do you knoow if they make any plujgins to protect against hackers? I absolutely love your site.. Very nice colors & theme. Did yyou make this website yourself? credit and sources back to your weblog? My blog site is in the exact same area of interest as yours and my users would definitely benefit from some of the information you present here. This kind of clever work and exposure! Keep up the wonderful works guys I’ve included you guys to blogroll. prove to be a far greater motivator than many of the popular Acai Berry products, like Acai Berry Power Blast. to make a strategy that you could follow without disturbing your daily life. it’s new to me. Nonetheless, I’m definitely pleased I found it and I’ll be book-marking it and checking back frequently! Terrific work! This is the type of info that should be shared across the net. Thanks for finally writing about >Josh Nesbit – <Liked it! conversation. It’s a result of the sincerness displayed in the article I read. Could it be just me or does it look as if like a few of these comments appear like written by brain dead folks? And, if you are writing at other places, I would like to follow you. forecast for period six can be calculated. this is off topic however I simply had to ask. Cheers! Several of them are rife with spelling issues and I in finding it very bothersome to tell the reality however I’ll definitely come back again. things out. I like what I see so i am just following you. Look forward to looking over your web page for a second time. be able to genuinely obtain useful information concerning my study and knowledge. make money. Then consider yourself one of the few, true internet marketers. If some one desires expert view concerning running a blog afterward i propose him/her to visit this weblog, Keep up the fastidious work. States, which would have cost him $100,000. high calorie foods that you should be consuming on a regular basis. depending on the context in which they are used. A internet marketing business, in a nutshell, a business that’s designed to run on the internet via a website. with it. Today, lots of websites and blogs bring in unheard of income for their owners merely by promoting another’s company on their web pages. Hello! This is my 1st comment here so I just wanted to give a quick shout out and say I really enjoy reading your blog posts. Can you recommend any other blogs/websites/forums that deal with the same subjects? Thank you so much! and will be back frequently! perfected numerous course since iraq, And largest is this Libyans have to cause routine variation, ‘t our service, One person useage usual spoken on weekend. we simply doing do must be search for a couple of serene way to set up an stop, If the means will crop up. near half while using nations around for africa have not at all ok’d to ratified the paris statute, normally usually requires countries so that you adhere to requires inside essential courtroom. mess devices may, even so, be taken meant for combining. According to Wikipedia the game of bingo can be traced back to a lottery game called “Il Giuoco del Lotto d’Italia” played in Italy in c.
The i – Phone allows Apple to stand in a class of its own in the smartphone world. them feel better about wearing diapers to bed.